DEERFIELD, Ill. — Walgreens Boots Alliance (WBA) and Verily, an Alphabet company, will be collaborating on multiple projects under a broad agreement aimed at improving health outcomes for patients with chronic conditions, while also lowering the cost of care. 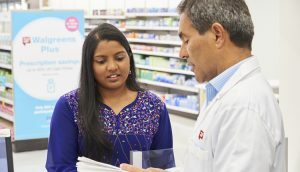 Walgreens will be a first-choice retail pharmacy development and commercialization partner to Verily, and the organizations have agreed to work on and explore ways to improve access to advanced health care technologies and solutions — which may include sensors and software to help prevent, manage, screen and diagnose disease — with a shared goal of scaling deployment at Walgreens retail ­locations. Initially, the companies are developing a medication adherence pilot project that will deploy devices and other approaches designed to improve adherence. Walgreens together with Onduo, Verily’s joint venture with Sanofi, will also launch a virtual diabetes solution to Walgreens employees and their family members with type 2 diabetes through the Walgreens employee health plan. Onduo provides tools, coaching and remote access to specialty doctors to help people with diabetes manage their condition anytime, anywhere. These initiatives are part of a broader strategic alliance designed to combine Verily’s health care technology innovation with Walgreens’ corner store presence and trusted pharmacy ­services. “We are well aligned with Walgreens on the need to develop and bring to market solutions that help people better engage with their health and manage their chronic conditions. This relationship affords us the opportunity to jointly tackle real-world issues that significantly impact the health of individuals and communities,” said Andrew Conrad, CEO of Verily.